The one I am reviewing today is regarded as one of the best plasma cutters out of all that is out in the market. Those of you who are well used to some sort of welding or metal sheet bending business, you might have heard the name of “LOTOS.” They are among the tech giants in the arena of plasma cutters. Well, in this review, I will try to break all the goods and bad of this product in details that will help you in decision making to buy the cutter you want. 3.1 Do we need anything else with this device like air gas? 3.2 Can I use this on single phase 220v like European style? 3.3 Can I use this for tig weld? 3.4 Can you recommend the air pressure that I will need to cut 1/8 to ¼ mild steel? 3.5 As this is a 50 amp machine, can I use it on 30 amp outlet? 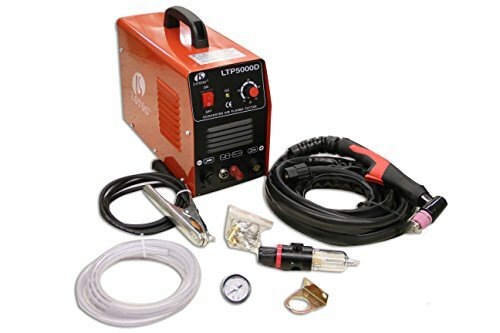 Why are you going to buy this Lotos model when there are so many other plasma cutters available on the market right now? The answer is simple for its quick features. So let me give you all the key features at a glance. It is combined with the latest technologies like Inverter technology. Works beautifully for both professional and non-professional users. Long torch with a hose of nine and a half feet long. Can work with both 110 and 220 volts. Can cut through a variety of different materials. Comes with air gauge and a MOSFET transistor. Can make precision cuts at a range of ½ inch to ¾ inches. Is a good cutter for those who are on the move. Constructed from military grade steel that makes it very durable. In the previous section, I discussed briefly the unique features of the Lotos Plasma cutter. Here, I will try to discuss all these features in-depth including all the necessary details. I assure you; after reading this complete review, you will have no problem in deciding the best Plasma Cutter for you. This plasma cutter can cut through all materials no matter if it is aluminum or steel. You’ve got all covered. This is designed for professionals, but not to worry even if you are a DIY user; this plasma cutter will serve you well. It provides very accurate cuts within a range of ½ to ¾ inches depending on the type of material you are using it on. The unit is widely renowned for its wide functionality across all sectors that relates to metal cutting. It uses only compressed air that is not harmful to cut through materials. If you are DIY user then this feature is specially designed just for you, unlike many plasma cutters, this Cutter is designed to be portable and compact. It comes with a handle to be carried like a metal box and is pretty lightweight. So it does not matter if you are using it in industry or for your home projects, you will always have this plasma cutter on the go. Forgot the days of those bulky, heavy plasma cutters. Get the same, to be honest, better performance but at a much smaller size. The world of tech is developing every day, and Lotos is no more of a difference, so they designed this plasma cutter infused of most modern technologies available in the market. They introduced MOSFET transistors that make sure you will always have the same output power from the cutter. The cutter can work at either of 110 volts or 220 volts. So you never have to worry about having a specific power outlet at your home or industry. Furthermore, the torch can cut metals without physically touching it and hence can cut even through painted and rusted materials. It produces less slag so the area of work becomes less messy. The plasma torch is very long with a hose of 9.5 feet length. It also arrives with a three pin connection. And, we all know that three pin connection is always safer than two pins. You do not even have to buy the nozzle; it is already included with the plasma cutter along with a cup. The ground clamp is also very big maximizing its flexibility (width of 2 inches and 6.8 feet long). Out of all the features, I mostly love the included air regulator. The gauge is very easy to read that can measure air pressure from 0-150 psi. Having less ground space to work? Try this plasma cutter. The bracket comes within the package can help mount this plasma cutter to the wall. Do we need anything else with this device like air gas? You will need air compressor along with an air hose as this machine uses compressed air to cut through metals. And both the hose and compressor are included with this machine, so you do not have to buy them separately. Can I use this on single phase 220v like European style? No, the included plug will not allow you to use it in European socket. You have to buy an adapter separately. Can I use this for tig weld? No, obviously not, this is not a welding machine. This is a high-end plasma cutter. Can you recommend the air pressure that I will need to cut 1/8 to ¼ mild steel? According to the manual, 70 psi is enough for the cuts of this length. However, practically I found, a pressure of 75 psi gives cuts that are more accurate. So I suggest you use 75 psi. As this is a 50 amp machine, can I use it on 30 amp outlet? You can, but the recommended amp is 50, so I will suggest you not to use it any less than 50 amps. This might damage the cutter. 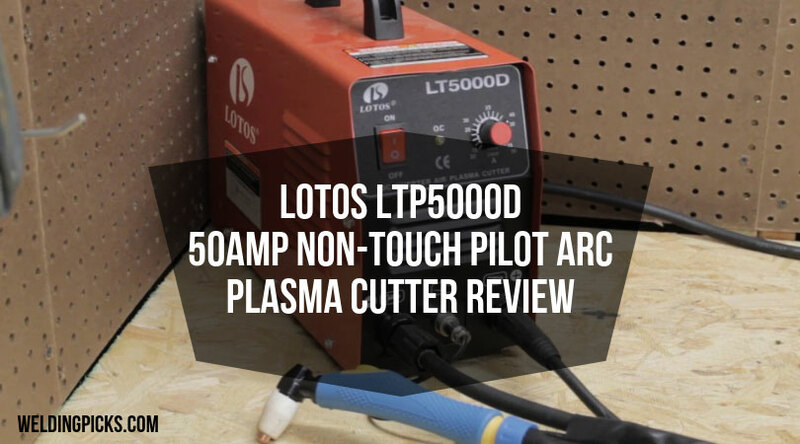 After reading this review, what is your thought on this LOTOS LTP5000D 50 amp arc plasma cutter? For me, it is the very best in the market for a shallow price range. This was designed for both professionals and DIY users. The flexibility of this cutter approves this idea very well. I use it, and for me, it is a very reliable and useful product. But do not trust me and do some research on your own. When you are done researching, I am sure you’ll have to come back to the Lotos plasma cutter. And this will be worth of every penny that you are going to invest in it.